Photo by: The Underground Tour. Years ago, before careers, kids and mortgages, I used to go on road trip adventures. One memorable road trip we drove through central Oregon, stopping in old ghost towns to explore abandoned churches, school houses and the occasional single family home if the front door was missing. I’ll admit – our main goal was to find a ghost, but it was also interesting to think about the building in its heyday, and the people who used to walk through their doors so many years ago. I can’t say that we found any evidence of ghosts, but it was fun to play at it anyway, armed only with a digital camera and a hand held tape recorder (I told you it was years ago). Today, I indulge any adventure lust closer to home, more along the lines of going to a history museum with my son or watching the occasional Ghost Hunters on television. I’ve been on the Underground Tour several times through the years, and have always enjoyed that interesting perspective into Seattle’s past; exploring the dusty tunnels beneath the streets of Pioneer Square that were once the city streets, walking past the dilapidated artifacts of a prior era. When I heard that the Underground had a new tour called Underground Paranormal Experience, I immediately thought back to my ghost town days and I had to see what it was about. Accompanied by a couple of friends whom I promised this would not scare, and they in turn promised they wouldn’t leave me alone in a dark underground tunnel, we arrived at Doc Maynard’s in Seattle’s historic Pioneer Square at 8:00 p.m. Saturday night for training. They took our jackets and bags (locking them up for us, telling us it was too hot in the tunnels to wear any extra garments). They assigned us each a sizable utility vest with large pockets containing ghost detecting equipment: a digital recorder for capturing Electronic Voice Phenomenon (EVPs); ear buds to plug into your digital recorder with jacked sound so hopefully you hear the disembodied voice as it’s being recorded; an Electro-Magnetic Frequency (EMF) detector to signal the presence of a ghost (which are thought to be measurable energy); and a pen light and a flashlight. My friend starts singing softy in my ear, “Who you gonna call…?” Admittedly, I did feel a little silly at this point, but everyone else looked the same, so it’s all in good fun, right? 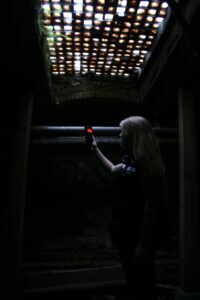 The first part of our training was watching an episode of the Travel Channel’s series Ghost Hunters when the team conducted their own investigation of Seattle Underground. The Ghost Hunters team heard all sorts of bumps and knocks and noises (what they call “experiences”) during their investigation and claimed that there was “something” down there that they couldn’t explain. The crowd is now pumped, and fully outfitted, for some ghost hunting of their own. Our highly animated and spirited guide (pun intended…) asks us to line up and follow him to our first location. We are taken out of the room, down an alley way and through a locked door on the side of building. Standing in complete darkness except for the beam of light coming from the tour guide’s flashlight, he begins by telling us a story about a murder that happened right outside the door we are facing, some 100 years ago, and then calls out to the ghost of the murdered man to make contact. Everyone listens attentively, scanning the darkness for signs of something out of the ordinary, or paranormal. We are instructed to use our EMF detector and walk around the room trying to find any energy spikes which might signal the presence of a ghost. The group shuffles around in the darkness, calling out their individual EMF readings in excited voices. After a few minutes, the guide leads us into another room through a dark tunnel and tells us a story about some of Seattle’s less-than-savory past where 2 men awaiting trial in jail were dragged out by an angry mob and lynched, along with a judge standing in the crowd who tried to stop the lynching. The crowd was thirsty for blood and hung the judge up, as well, though he managed to escape. The tour guide called out to the spirits of the dead men, asking them to make their presences known, and the group listened in rapt silence in the dark room, waiting – hoping for a response. And so the tour continued in this way – the tour guide regaling us with morbid stories of murder and injustice and then giving us time to use the tools they’d given us to conduct our own investigations. Our tour guide was a great story teller, so even though I cannot say I witnessed anything paranormal, we were very entertained and were glad to have the experience. In keeping with the theme of evening, we finished the night at the historic Merchant’s Café, one of the oldest running restaurants in Seattle, across the street from Doc Maynard’s, heading downstairs to the lower level where it’s reported that the ghost of the former owner’s wife, when the bar was a brothel and gambling parlor, is said to haunt. Here’s a link to make reservations for the Underground Paranormal Experience. Tours are scheduled every Friday and Saturday at 8 p.m.
Susan Treder is the Director of Human Resources at Visit Seattle. She lives north of Seattle with her son, a weird cat and a baby ball python named Snakels. In her spare time she loves tackling yard work and taking long, rambling walks through interesting neighborhoods.